It is the ratio of water and cement (by weight or by volume) used in the preparation of concrete. The quantity of water used in mixing concrete is very important. If the percentage of water used is less then there shall not be sufficient quantity of water to hydrate cement. It shall result in porous and weak concrete. However, the usual tendency is to use too much water which gives a more workable mix but it does not give sound concrete. Too much of water results in segregation of aggregates and gives porous concrete of low strength and low density. (Fig. 8.1.). A certain minimum proportion of water is necessary in order to hydrate the cement completely. To make the concrete sufficiently workable to be placed in position some more water is needed. So long as the concrete is sufficiently workable, for the method of placing used, its strength depends upon the proportion of water to the cement in the mix. Water cement ratio should not be allowed to exceed the specified limits for various types of concrete and should generally be kept as low as the methods of placing will allow. Professor Abrahms as a result of large number of experiments states that “with given materials and conditions of test, the ratio of quantity of mixing water to the quantity of cement alone determines the strength of concrete so long as the mix is of a workable plasticity.” This is known as water cement ratio law. 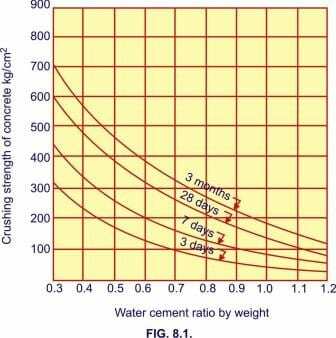 According to this law the strength of concrete will not increase by simply increasing the quantity of cement unless the water cement ratio is reduced. A simple and a practical way of controlling the water content is by means of slump test explained below. 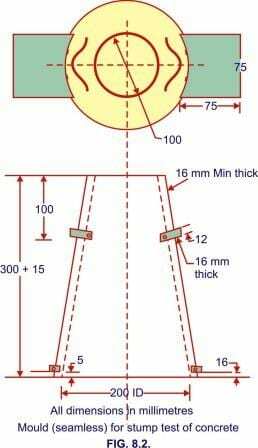 To conduct this test a truncated cone of steel (Fig. 8.2.) 30 cm high, 20 cm diameter at the base, 10 cm diameter on the top and provided with handles is used. Concrete is filled in the cone in layers of 7.5 cm at a time, each layer being rammed 25 times with a metallic tamping rod 16 mm in diameter and 60 cm long. Just after the slump cone has thus been filled then it is lifted. The extent by which the concrete drops is called the slump. It is measured from the top of cone to the top of concrete after the cone has been removed. the cone has been removed. The usual values of the slump of concrete used for various purposes are given below and depends upon the method of compaction possible in each case. Where there is no obstruction by way of reinforcement etc., in the movement of concrete or where the concrete can be rammed hard in the case the smaller value of slump is required. Workability of concrete and Compaction factor test.